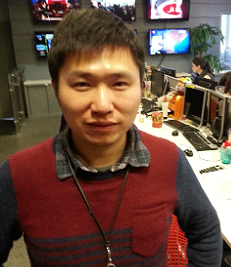 Shanghai TV: news production - drones-studio-SNG-3G. 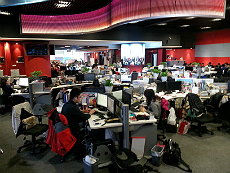 Shanghai, March 2014: The technical unit at Shanghai Media Group (SMG) is always on the lookout for new ways of enhancing the company's newsgathering capabilities. One technology it's now focusing on is drones. The head of the technical unit, Sheng Song, told TVZ, "We set up a special team a few months ago and we have now built our own drones. They've been very successful. For example, we used them for covering the heavy traffic on national holidays." The drones have maximum flying time of about 15 to 20 minutes but that's sufficient to provide good quality aerial shots. Shanghai Media Group has two major channels which broadcast news: Dragon TV which caters to domestic and international news and Shanghai TV which broadcasts metropolitan news. 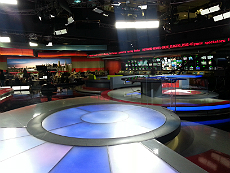 Their facilities are very modern and include what's currently the largest news studio in China. News production is done on Avid's iNews system. Shanghai we will either usually use AP facilities or we will use BGANs." The company has seven BGAN terminals, one SNG vehicle and two flyaways. The flyaways are only deployed to news events within China. SMG has also been experimenting with cellular transmissions using equipment provided by TVU Networks but has had limited success, not because of the gear but because of the unreliable networks. Mr Sheng explained, "Maybe the success rate has been 50 %. The problem for us is the networks within China. We have used both China Telecom and China Unicom but we just can't get reliable bandwidth on the 3G system." 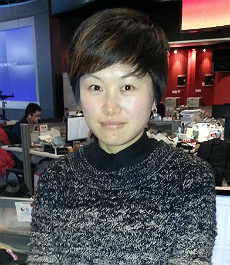 He said, "We hope the networks will improve because it would help us to save money. For example, at the moment we have to pay for a leased line from our Hong Kong bureau. It would be good if we could transmit from there using the cellular networks."